The use of submarines and underwater mines in WWI profoundly influenced the development of underwater acoustics. German submarines (called U-boats) targeted shipping between the United States and Europe, sinking nearly 10 million tons of cargo in two years, severely crippling the U.S. and European Allied Forces’ supply lines. Explosions from contact mines suspended on underwater cables also took their toll. Total losses due to mines by both German and Allied forces were 146 war vessels (including 40 submarines), 267 auxiliary vessels, and 586 merchant ships. The effectiveness of submarines and underwater mines in naval warfare was undisputable. Underwater sound could be used to detect submerged submarines and mines, and underwater acoustics subsequently became closely associated with military applications (and research on undersea sound became wrapped in a veil of secrecy). During WWI, submarines were detected by listening for their engines or propellers. A simple two-earphone (air tube) device was worn by the sonar operator who could determine the direction from which the sound arrived by mechanically rotating the receiver. 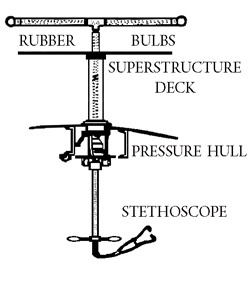 A number of different towed receivers were also developed for use by surface ships, in order to put the hydrophones further from the noise produced by the ship. During WWI, in 1917, Paul Langevin, a French physicist, used the piezoelectric effect, which had been discovered in 1880 by Paul-Jacques and Pierre Curie, to build an echo-ranging system. When a changing voltage is applied to a crystal at the desired frequency, they expand and contract, generating a sound wave. Langevin built an echo-ranging system using quartz crystals placed between two steel plates to generate sound. In 1918 for the first time, echoes were received from a submarine at distances as great as 1500 m. WWI came to an end, however, before underwater echo ranging could meet the German U-boat threat.